Brian and I winterized Detour this past December at the Wentworth by the Sea Marina, and then we jumped ship for the winter and headed out to our family in San Francisco for a taste of the real world without the messy snow. We’ve just returned to New Castle, New Hampshire and weren’t sure what to expect to find since Detour fended for itself through a brutal winter season. 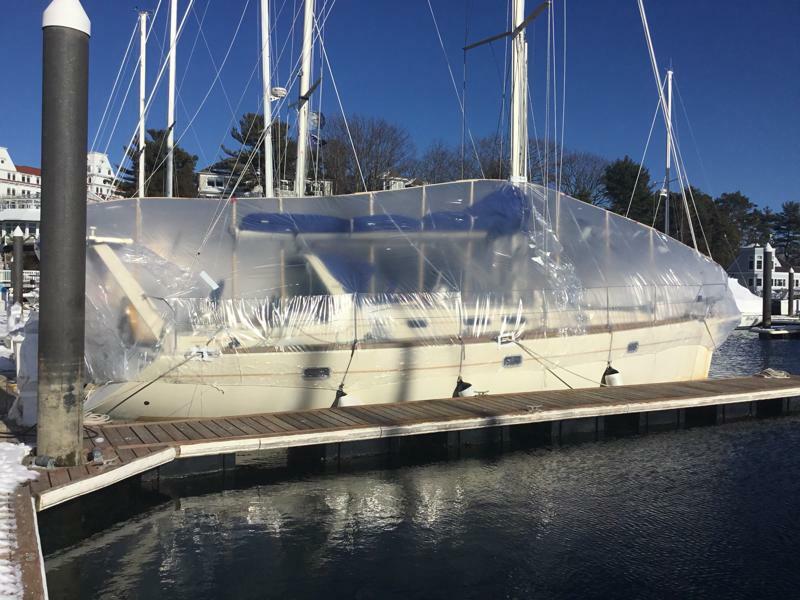 Thankfully, our DIY shrink wrapping stayed intact (the guys from Clark Marine Services who wrap a majority of the boats at the marina did have a bet going, however, and didn’t think our wrap would survive January! And these guys know their shrink wrap!). Detour was dry as a bone inside. The recurrent bomb cyclone storms on the east coast snapped two of our dock lines, broke our AIS antenna cap, and bent two stanchions (tension from shrink wrap). No biggie! No surprises! Oh, I was surprised by a bin full of rotten potatoes – EEEEWWWWWWW! Unwrapped, it’s time to get this show on the road. But first…cocktails! Glad to see you’re back on the water. Always look for your posts. It’s wonderful to have you back online! Looking forward to the next adventure. Thanks for sharing. Wow! Wonderful you’ve started up the blog again. It’s awaesome to have you back. I really did miss my frequent travel blog from you two. I’m living vicariously though you guys!! Welcome back! 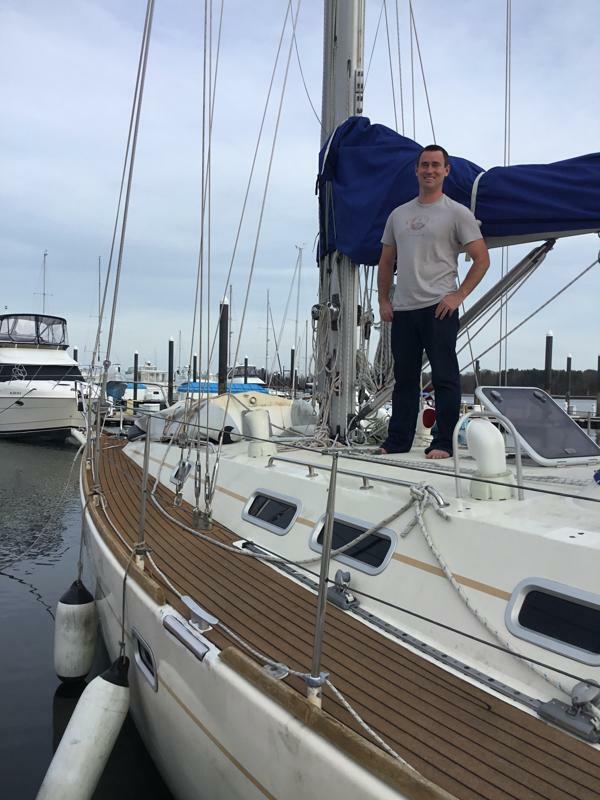 I’d love to connect with you two world travelers again while you’re here and scope out your beautiful boat. Ours gets launched in Eliot on the 10th so maybe after that happens! Kit, we’d love to connect! We’ll start moseying around these waters on Tuesday, I’ll email you so we can make a plan. Mark, it’s great to be home and I’m looking forward to sharing the next venture with you! Thanks for keeping in touch. Thanks, Marilyn, it’s good to be home! Thanks, Nikki, more posts to come! Hi Kit, we’re in Portland this week, couldn’t resist the southerly forecast for a beautiful sail yesterday! I don’t blame you for jumping on the opportunity! We are still getting settled in, the new sails have some heavy duty dogs that need “editing” in order to slide into the track. So, I’m bummed we didn’t connect but will have fingers crossed we can make it happen! This Saturday we’re having a little membership potluck at Great Cove, keep us posted where you are and I’ll make everyone salivate by showing them you’ve gotten a jumpstart to the Gulf of Maine crusiiing season!